Haystacks Media is your one-stop-shop for print and display needs. Located in beautiful Halifax, Nova Scotia, they have integrated display and decor, printing, and kit fulfillment in one company, to provide their customers with end-to-end media needs. 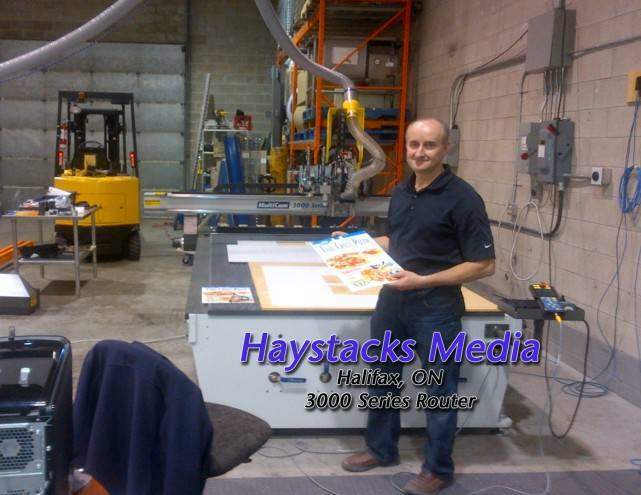 A MultiCam 3000 Series Router was installed to help Haystacks deliver on their goal of being a one-step media solutions provider. The versatility and speed of the 3000 Router allows Haystacks to switch cutting jobs and materials quickly and seamlessly. We fitted the 3000 Router with a dual knife and router head. This allows Haystacks to switch between knife applications for materials such as cardstock, foam core, vinyls, and other thin materials, and router applications for materials such as acrylics, woods, and sign board.